Second grade is a pivotal time in the formation of the children in Christ, particularly with the preparations made prior to reception of the sacraments of Reconciliation and Eucharist. The children begin the year with foundational teachings of the Church’s doctrines. The children study and learn about the mystery of the Blessed Trinity, the divinity and humanity of Christ, as well as the implications these mysteries have on their lives. The majority of the school year is spent preparing the children’s hearts and souls for a deeper relationship with Christ. Immediate preparations for the Sacrament of Reconciliation include studying the Ten Commandments and discussions to form the children’s consciences. Students are also exposed to the Scripture accounts, which particularly manifest Christ’s forgiveness and mercy. 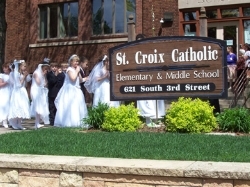 The climax of the second grade year is the reception of First Holy Communion. The children prepare their hearts, especially through prayer, to receive Jesus for the first time. They are guided to a deeper understanding of Christ’s true Presence in the Blessed Sacrament by attending weekly school Mass and learning about the Mass. In addition, the children see and interact with parish priests who assist them in deepening their knowledge and understanding of the faith. Because of the strong faith formation that happens within St. Croix Catholic's middle school program, the sacrament of Confirmation is made available to SCCS 8th grade students who desire to receive it at this time of their lives. (The option to receive later in 9th grade remains through the parishes' Faith Formation program.) Contact Mrs. Katie Ranniger for more information: kranniger@stccs.com. Throughout the three years of religion at SCCS Middle School, the students receive a firm foundation in the virtues – both what they are and the practice of how to live out particular ones in our lives. The model of the saints not only inspires, but also provides the support of prayer from those who have gone before us to “fight the good fight.” This virtuous living is the foundation for God’s grace to build in our lives. In addition, in these three years of Middle School, the students are introduced into concrete ways to form personal habits of prayer, in order to build their personal relationship with Jesus, the One Whom they follow more intimately upon receiving the sacrament of Confirmation.